With all the talk of doing a product launch online thanks to Jeff Walker’s Product Launch Formula 2.0 release, I thought I should talk a little bit about how blogging can be used to launch a product based on my experiences. My list was built off the back of this blog and I have conducted a product launch process a couple of times. In this audio I go through some of the techniques, the mistakes and the successes I have experienced over my three years as a blogger, which led to the eventual successful launch of an information product, which I made over $150,000 from. If you are thinking of doing a product launch online, or a relaunch or closing down sale or any kind of online promotion, and if you want to know my opinion of Product Launch Formula (and let me be frank – I did NOT plan on buying the product at first because I didn’t think I needed it), then this is a podcast you have to listen to. There’s lots of good content in this audio and some behinds the scenes stuff too, plus at the end I’m offering a special bonus. You will just have to listen to the audio to find out what it is (okay, here’s a clue – the bonus includes a free one of these, the same MP3 player I use – the iRiver S10). Note: To get the bonus you have to take action on Thursday 27th of March 2008 at 2PM EST (USA time) when Product Launch Formula 2.0 is released for 24 hours only, so listen to this audio before that date or you miss out! Success with No List and No Affiliates? If you are still worried about conducting a launch without an email list, watch the latest free video from Jeff about the guy who started with no list, no web site, and no joint venture partners and did over $7,000 in sales – impressive stuff! I always wonder how can someone create such buzz that people will flock to your blog for the product launch. I also think about the expense to do this. But the resources you provided prove that anyone can actually do this. Thanks for the resources, and I’ll look into the product launch formula site. I am in the mids of my own launch (care to join me?) and I feel I felt in the middle of launch crazyness but on the other hand with guys like you sharing so many tips it’s really motivating. Do you mean you had a product launch spread over the last 10 month? Great stuff Yaro – looking forward to listening to the whole audio. This product launch stuff is pretty interesting…I’m continually reminded of the frenzy behind the iPhone before it came out – kind of a main-stream launch of sorts. I’m looking forward to implementing this type of strategy soon. Thanks for the tips! Long time student of yours. I have been following the product launch formula story since you first mentioned it a while back, and I am thinking of getting it. Anyways I am very interested in building lists, I have a few emails already, the only thing about my emails, they have a short life span. They are brides to be, and once they are married I usually delete them from my list. I know there has to be something I can do. 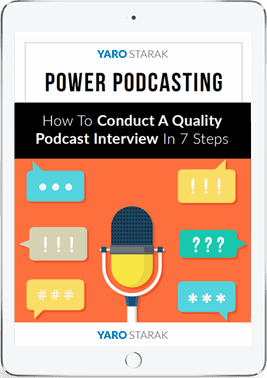 Great info in your podcast. I have been working on building a good list through my ezine, customer base, and articles. It is such a huge learning curve. Thank you so much for your tips. I enjoy listening and reading your tips and learning to put them into action. Once again, great, practical advice from someone who has gone through the processs and succeeded. Thanks! I’m curious, I haven’t watched any of Jeff’s videos at all this time round, figured I already owned it so don’t need to know about the new one, do you think his next one will be much different? I’m thinking of picking it up just to see any updates he’s made. Wow! Fantastic podcast. I really liked how you stressed the importance of a list in this podcast. I agree that it is more important to build a list than to build RSS subscribers. I do know someone who makes a ton of money without a list, but I think he is the exception to the rule. thanks for your input. I should have listened to the podcast first..
Oh wow, well then that’s surely worth it to have the access to Jeff. I really enjoyed PLF 1, I managed to do a pretty decent launch in a smaller niche. Renu – No, I meant the income stream it created was recursive, so during the next 10 months the money kept rolling in to the tune of over $150K. Vera – Jeff’s made some big changes with PLF 2.0, especially in how he is delivering it. It’s not a homestudy program with disks and manuals, it’s an online 6-week course, where you work with Jeff and the other students through teleconferences, online video and study materials. I think the access to Jeff is a big deal in this case – that’s why I would buy it. Jeff’s also got some new ideas inside the program, like the concept of stacking your launches and using social media as part of a launch. Given how much the Web has changed in the last two years since PLF 1.0 was released, you would have to expect a lot of changes in the 2.0 version. Let’s not forget Jeff himself has been involved in some big launches since then too, so he’s learned a lot more to pack into the new PLF. What a top audio Yaro, well done. I resonated with your tip about purchasing courses to get access to the authors. That is the main reason why I ever buy a course, and I must say that it works. I then have almost straight access to the author. PS I’m in pre-launch for my 4th launch and they do work wonders. Another great and engaging article yaro. And the new design looks terrific. I can see some of the bugs you’re working on but the overall vibe is excellent. Finally got round to listening to this podcast. It is a great one too. I have found it a great listen full of information and a nice way to learn the easy way on a Sunday afternoon. I am planning a launch for the end of the year. As such I find it interesting in my build up. At the minute the list building has commenced. I launched the website at the beginning of March. Unfortunately at this point, PLF is well out of my budget. It sounds interesting though. I am glad you are against ipods too. Thanks for the mp3 yaro. pdf version is available for this report? I generally read, don’t listen much.